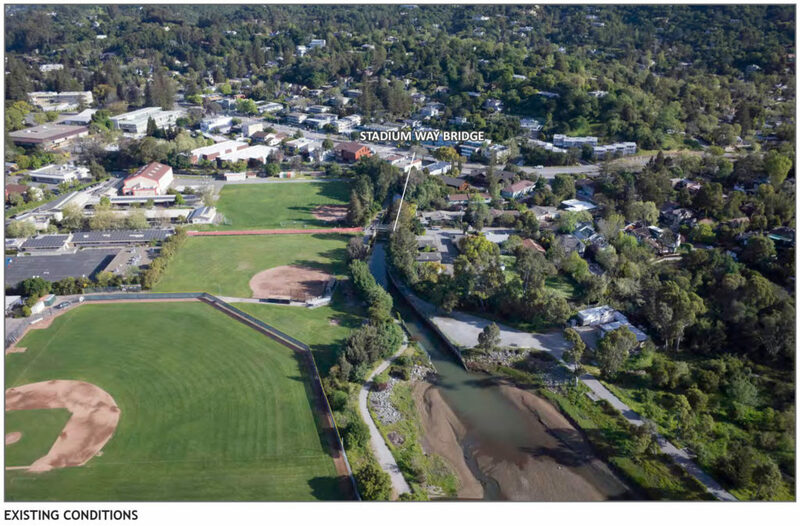 This proposal was funded by Friends of Corte Madera Creek Watershed, and presents alternatives to setback walls and berms in Kentfield. These conceptual designs will be analyzed in the EIR that the Flood Control District will prepare for flood management in Ross and Kentfield. • Restores tidal wetland, transition zone, and mud flat habitat to accommodate sea-level rise. 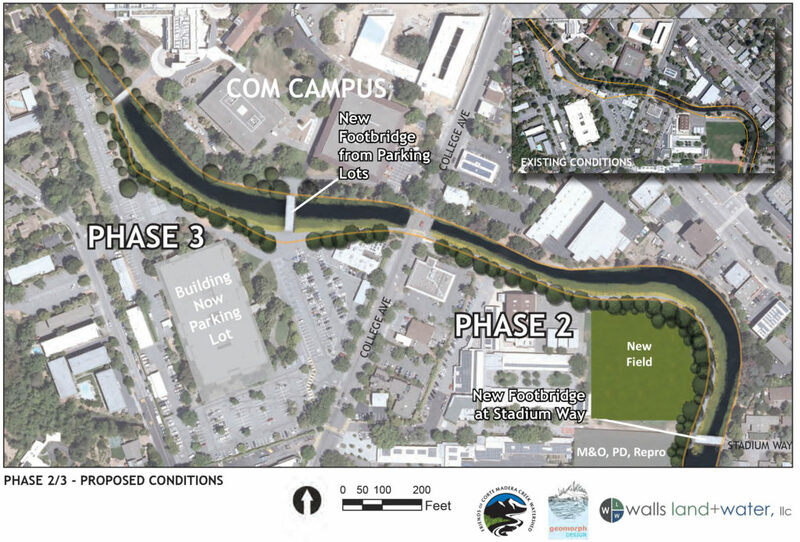 Project Components: At the present time, the conceptual designs for all three phases assume that the concrete wall on the generally uphill side of the creek across from KMS and several COM parking lots (the left side of the channel, looking downstream) would remain in place because a large RVSD sewer was installed next to the wall when the current channel was constructed. 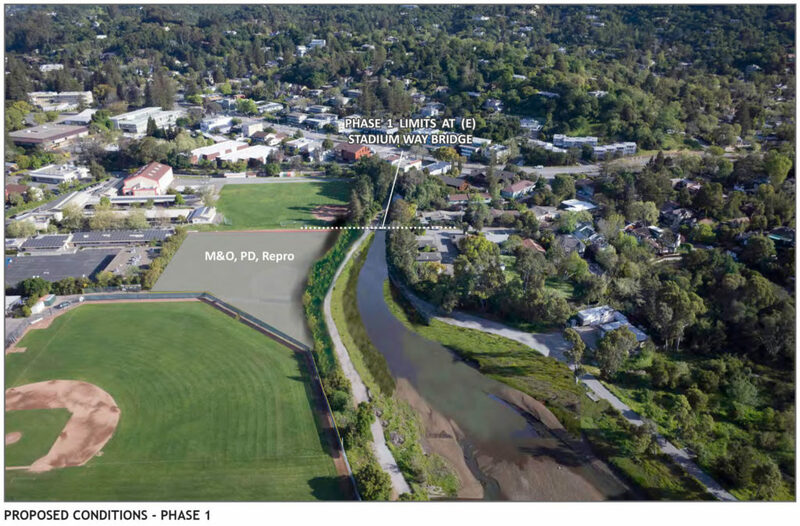 The only exception is the 150 feet of Phase 1 furthest downstream, where the sewer leaves the wall and is routed to RVSD’s Kentfield Pump Station. As budgets and designs are developed, the feasibility of moving the sewer in some locations will be studied. If there is adequate space and no conflicts with other infrastructure, it may be cheaper to move and replace the sewer, now 50 years old, and eliminate that part of the wall. This would most likely happen upstream of College Avenue. There are four projects associated with Creekside Marsh at Hal Brown Park, described below. One project is to improve the health of the southeastern part of the marsh (the panhandle) and two are to compensate for the unavoidable impacts of bridge construction. Southeastern Creekside Marsh Culvert Replacement and Habitat Enhancement: This project has two components. The first is to replace the old, decomposing culvert just upstream of the Bon Air Bridge; this culvert mutes tidal flow into the panhandle part of the marsh. Three larger parallel culverts will be installed to convey enough tidal flow to match the equilibrium width of the channel in the marsh near the culvert. The second component is to increase the amount of marsh vegetation. Tests show that bare areas that do not support marsh vegetation have almost no pore space, too much gravel, high pH, and high salinity. The poor soil will be excavated and replaced with better soil excavated from the site of the larger culvert. Friends managed the project during the early phases, but for construction, which is expected to begin in summer 2016, the project will be led by Marin County Parks. It will funded mostly from Community Services Area 17 monies used to maintain and enhance Creekside Park and by Regional Water Quality Control Board fines collected from the Ross Valley Sanitary District. 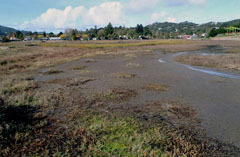 Habitat Enhancement to Compensate for Impacts of the Central Marin Ferry Connector: This project includes removing the wooden deck that is in the marsh, and gravel in the north end of the marsh that has inhibited marsh plant growth and blocked flow within the marsh. The deck and the path leading to it occupy what should be marsh vegetation and invite people into Ridgway’s rail habitat. It also seems to encourage kids to ride bicycles in the marsh, destroying vegetation and disturbing birds. This project is expected to begin in September 2016. Friends was involved in the early stages of the project, but it is being implemented by Marin County Parks and funded by the Transportation Authority of Marin. Habitat Enhancement to Compensate for Impacts of the Bon Air Bridge Replacement: The US Fish and Wildlife Service required the installation of gumplant and coyote brush to provide high-tide refugia for birds, especially Ridgway’s rails that use Creekside Marsh. The original planting was done in early January 2012. 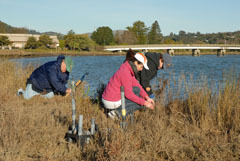 The drought has resulted in high mortality of the young plants, and we continue to install more plants and sow seeds to meet the goal of a barrier between the marsh and the multi-use path along Corte Madera Creek. This work is implemented by Friends and funded by the City of Larkspur. Upland Habitat Enhancement: Marin County Parks and One Tam are using volunteers to expand native plants in areas infested by Harding grass, an aggressive invasive weed. First the grass is cut and covered with cardboard and a thick layer of chipped wood (coarse mulch). After a couple of years, most of the grass is dead and native shrubs are installed. The work is taking place on the perimeter of the developed part of the park, outside the wetland area. It is funded by Marin County Parks and One Tam. Volunteers from Friends also participate. this a challenging site. First, we did not receive permission to remove some nearby tall acacias. Second, domestic geese that were being fed nearby grazed on the newly-planted native vegetation, doing severe damage. The native geese have since been removed and the vegetation is improving. The project is maintained by Larkspur Creekside residents. Funding was provided by the U.S Fish and Wildlife Service Private Stewardship Grant Program, the Ross Valley Sanitary District, and Larkspur Creekside HOA. 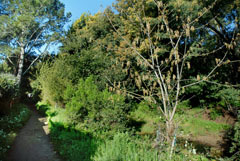 Begun in the fall of 1996, this cooperative endeavor with Redwood High School classes and the City of Larkspur has led to the revegetation of one bank of a largely tidal section of Larkspur Creek between Doherty Drive and Meadowood Drive. The artificial channel is about 1500 feet long, cuts through filled marshland, and bounds the Rose Lane housing development on two sides. We have removed acacia trees, pampas grass, broom, blackberry and fennel, and replaced them with native plants. The exposed location and poor soil are challenges for revegetation, so plantings have been restricted to 6 species of trees (mainly coast live oak and willow), 7 species of shrubs and vines, and 4 species of grasses, sedges and rushes. As these species grow and provide shade and leaf litter, the environment should become more hospitable to a wider variety of plants. In the upper stretch of Friends’ project on Larkspur Creek, we replaced an avenue of acacia trees along the public footpath with oaks, box-elder, willows and buckeye. 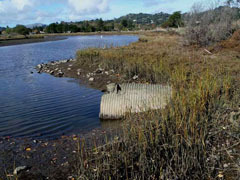 Funding has been provided by the Marin County Wildlife and Fisheries Advisory Committee. Complementing Friends’ work, the Rose Garden management has installed native trees on its side of the creek, so we can look forward to a healthy riparian corridor along lower Larkspur Creek.